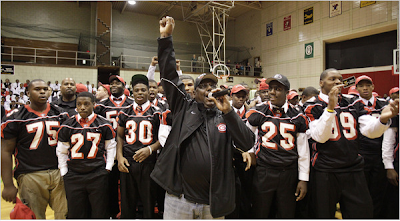 Ted Ginn Sr. with his team at Glenville, the first Cleveland public school to play for a state title. CLEVELAND — On Thursday, the football team at Glenville High School sauntered into the gymnasium, their bodies swinging to bass beats. This was not a normal pep rally. Recruiters from major colleges lined the walls. A local radio station hosted. When it ended, the players headed to their final practice before they become the first Cleveland public school to play for a state championship on Saturday. Swept up by euphoria, they bounded past the writing on the wall, two words that summed their season. Making history, it read. Glenville has produced the track icon Jesse Owens and the creators of the Superman comic book, but never a state football champion. The high school is located east of downtown, past neighborhoods pocked with boarded-up houses and men sitting on stoops, sipping tall cans of beer on a recent morning. The majority of the players attend nearby Ginn Academy, the brainchild of Ted Ginn Sr., who doubles as Glenville’s football coach. Earlier this week, they met with a youth minister and scribbled their distractions on scraps of paper. Ginn cares little about history, dismissing the obvious narrative — inner-city team beats opponents with more students, more funding, more everything — as too simplistic. At his academy, the focus is on mentoring, not football. But the core values — discipline, love, passion — remain the same. His is a sociological experiment, Ginn said, with football as the vehicle to disprove myths and perceptions about inner-city schools. As Ginn built Glenville into a state power, he watched opposing coaches stalk off the field after losses, embarrassed. The same coaches who used to laud Ginn for the impact of his work, now say he cheats or that he recruits, Ginn said. Therein lies the twist. Can his team teach others their core values through football? Can they prove they are like anybody else? More than 100 of Ginn’s players have earned athletic scholarships, including 21 in 2005. Five play in the N.F.L. This is not his most talented team, but it might be his most unlikely championship candidate. Strange fruit, Ginn calls this group, sweet and sour and streaky all at once. Like Jayrone Elliott, a senior linebacker who earlier this season lay on the field, as if seriously injured. As Ginn sprinted to his side, Elliott winked and said, “Conserving energy, Coach.” That is strange, Ginn said. This team always appears lost in space, not paying attention, but they seem to retain everything Ginn says. Before road games, they put on talent shows in the team hotel, providing perfect impressions of their coaches. Ginn said that was their genius. They are goofy, but faithful. They win because they love their coach, their program and their community. The unlikely championship contenders follow a man with unusual methods, a visionary who sees in them what others miss. Ginn rules with a heavy hand and a soft touch. He suspended 29 players for a playoff game last season and lost by a point. He benched quarterback Cardale Jones earlier this season. Ginn learned this approach here, where he played for Glenville and worked as a security guard before he opened the academy. At 19, his mother died, and his landlord raised his rent by $10. This infuriated Ginn until he realized the man had done so because his wife would wash Ginn’s clothes, cook his meals, fill his refrigerator with food. Right then, Ginn decided he would spend his life giving back to the community that raised him. He also learned that trust builds loyalty. Just ask Tony Overton. He grew up near the school and played football for Ginn when a city championship marked the highest expectation. When his father fell ill, Ginn stepped in, and now, Overton said, they are like Joe and Jay Paterno. This year’s team started slowly, losing their first game and falling behind by two scores in each of their next two contests. Each quarter proved its own adventure, but in each game after the first, Glenville won. Each time, Ginn gave a more rousing pregame speech than the one before. He referenced President Barack Obama, told them this was a year for change. Before the state semifinal, he spoke about leaning forward, like a sprinter, at the finish. They triumphed in that game, too, accomplishing something no other metro public school had done. To Elliott, the why was simple. Other schools, he said, did not have Ginn. For a struggling community, the football team presents a welcome reprieve, a focal point for progress. Like “you’re walking around in a fog of excitement,” said Jacqueline Bell, the principal at Glenville. Everyone pitched in. Donte Whitner, an alumnus who plays for the Buffalo Bills, purchased cleats. Someone else donated temporary lighting for the practice field, and before that, parents parked their cars and turned their headlights on. For lifers like Bell and Overton, congratulations have poured in, dozens of letters, e-mail messages and phone calls. Overton has to remind them that the real success came long before, in the players who did not succumb to the dangers that surround them. Parrish calls Ginn “Mr. Cleveland” and “the most visible person” in the city besides the basketball star LeBron James. But Ginn says this is not about him, even if everyone else disagrees. Jones once thought people only made history when they died. But through this team and the history being created, Ginn’s lessons have been reinforced. Labels: donte whitner, ted ginn jr., ted ginn sr.